For our January installment of ArtStarts on Saturdays workshop series, we were delighted to host Aché Brasil for a fun and engaging workshop where both parents and kids were clapping along and dancing to the drumming rhythms. Through their songs and choreographed movements, Aché Brasil incorporates the historical context and origins of Capoeira. The audience was invited to call out loud “Maracatu the Warrior”, while the artists danced and performed in their colorful costumes, an energetic procession representing the coronation festivities surrounding the African King and Queen in Brazil. At the end of the show they featured a number that brought a boy and a girl onto the stage to play to king and queen of the story. We also learned about the different instruments used in this powerful Brazilian art form. Kids had the chance to listen to the sounds of the berimbau, the atabaque, the pandeiro, the atabá (tambourine) and the a-go-go. 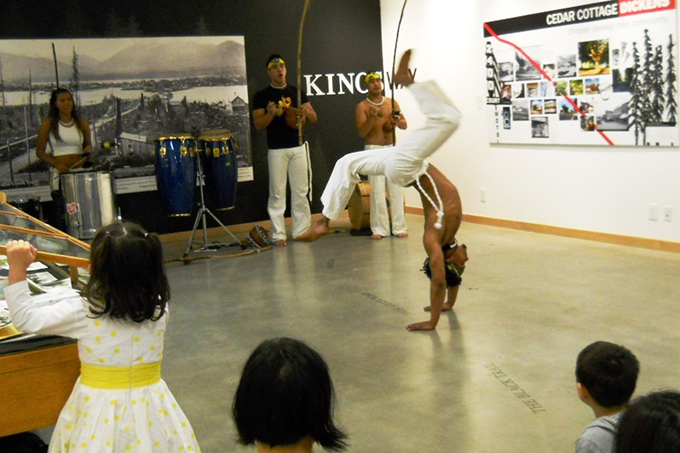 The artists made good use of the gallery space, performing lots of high jumps and martial arts moves that kept us all hypnotized. Guests were thoroughly impressed with this high energy performance and a parent even commented “it was one of the best I have attended”. ArtStarts on Saturdays takes place on the last Saturday of every month — check out past workshops here. Stay tuned for our next African Drumming with MaObong Oku on February 25th, guaranteed to get you moving. MaObong Oku leads a true African cultural experience as the family has the chance to explore space, rhythm and expression.